The Paradise Resort location on Long Beach stuns you. The world class views of Phi Phi Ley whose 300m cliffs can be seen just 5 km away, the cliffs of the main Tonsai Bay, the coral seas just 20 meters over the sand, leave you breathless. This is it... you have found the right place on earth to enjoy natures bounty. Cut off from the busier village by a undulating path, Long beach has no cars or bikes. Only 10 minutes by longtail boat taxi (that run all night) you can enjoy the variety of restaurants and nightlife in the village near the main pier. The snorkeling out by the rocks is some of the best on PP and dive tours to the other reefs make this a true resort choice. 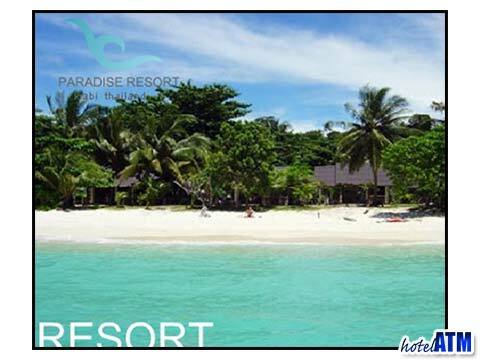 The Paradise Resort features in our Top 10 hand-picked hotels of the Best Bungalows on Phi Phi Island.